Ah, the joy of cooking. If Julia Child taught us anything, it’s that there is pleasure in putting together a well-crafted, delectable meal. At least, in theory. But anyone who’s ever run out of an ingredient, nicked a finger while dicing or overcooked the shrimp knows that not every meal preparation experience is a delightful one. And with the busyness of daily life, grocery shopping for the necessary ingredients and getting dinner on the table can feel overwhelming. That’s where Home Chef comes in. 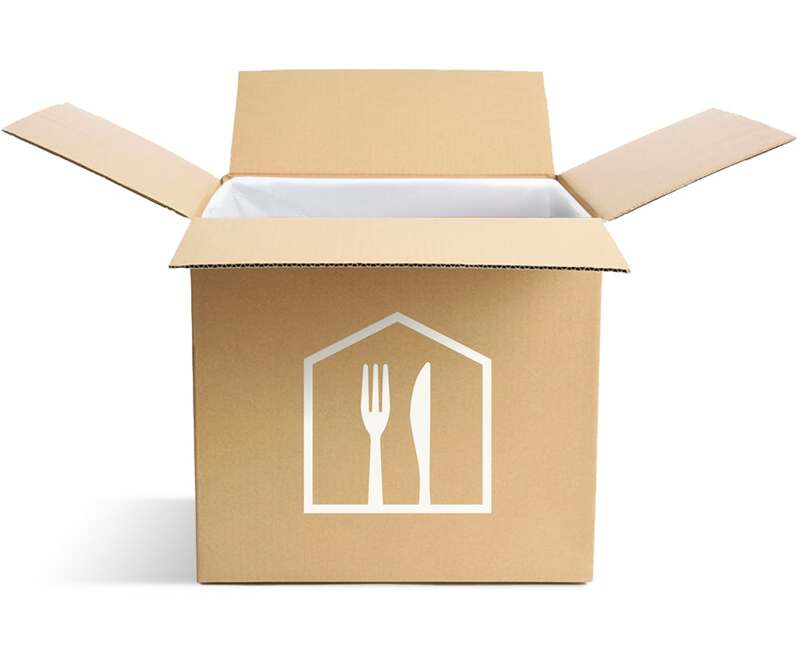 Home Chef, like many of the other meal subscription services cropping up today, purports to deliver “home cooking made simple.” Does it? 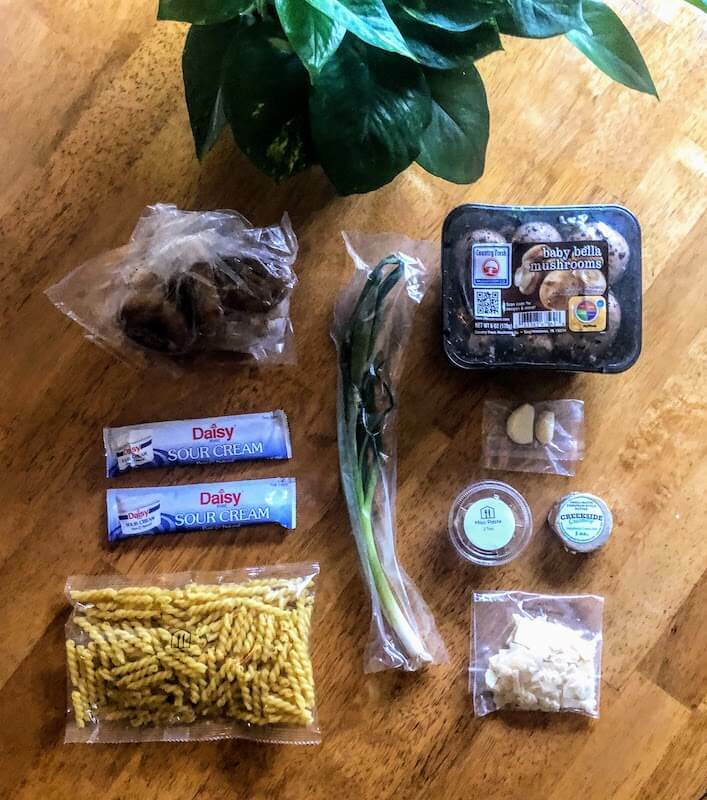 I got a week of meals delivered to my door to put it to the test. 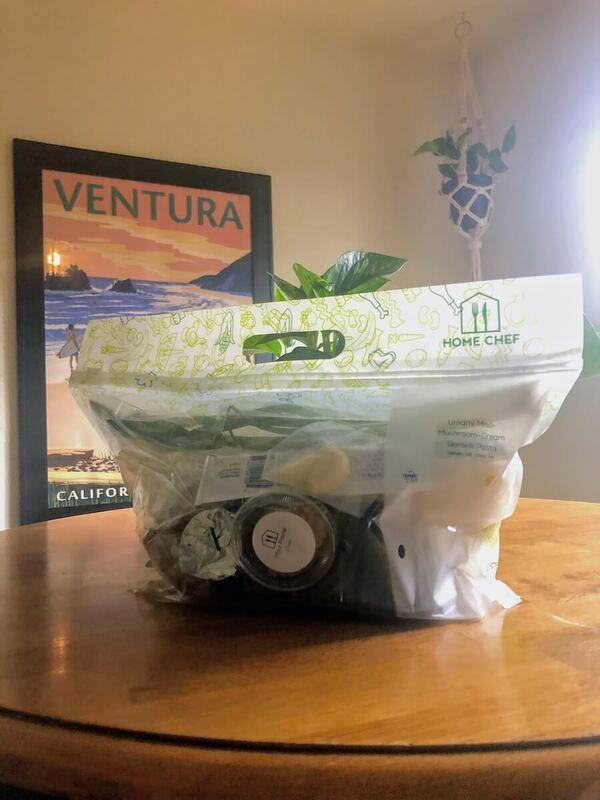 The ingredients for each Home Chef meal come conveniently packed in their own bag. Image provided by Kacie Goff. Remember what we were saying about how life gets busy? That was underscored for me as I boarded a plane to Colorado the day I had scheduled my Home Chef delivery. Not ideal. I was only going to be gone for a few days, but that meant it fell to my husband to make sure everything was put away so that it would keep. And I had to wonder, after already being exposed to who-knows-what during the shipping process, would the produce still be fresh upon my return? What about the shrimp-based meal I so boldly ordered? I’m happy to report that Home Chef makes every step of the process, including storing food until you’re ready to prepare it, a no-brainer. One of my least favorite things in the world is putting away groceries. Home Chef takes the legwork out of it for you. Each meal comes packed in a convenient zip-top bag. All my trusty partner had to do was load our three bags into the fridge and — bam! — he was done. And the simplicity of the system is brilliant on both ends. It means it takes seconds to put your Home Chef meals away, and it also means that when you’re ready to cook, you literally just need to grab a bag and go. That is, in my opinion, genius. Unlike other meal delivery services (e.g. HelloFresh, Blue Apron), Home Chef doesn’t have set meal plan pricing. Instead, you pay per meal based on the recipe you choose. Their standard meals are priced at $20 for two servings or $40 for four. For premium meals, you’ll pay market price. Here’s a look at all the ingredients one of my meal bags contained. Image provided by Kacie Goff. Okay, moment of honesty here: I don’t love cooking. I don’t hate it, necessarily, but after a full day of work, I’d rather be in the bath with a big glass of wine than standing over the stove. Some people truly find joy in preparing a meal, but I’m not one of those people. I cook out of necessity. And, occasionally, I like the end result enough that I retroactively decide I had a nice time preparing a specific meal. We received three meals in our Home Chef shipment and I went three for three on actually enjoying the creation of them. Not bad! It’s also worth noting that I’m a pescatarian so all of my meals will be mostly plant and fish-based. Now, let’s talk details. From bag to table in under 30 minutes! Image provided by Kacie Goff. 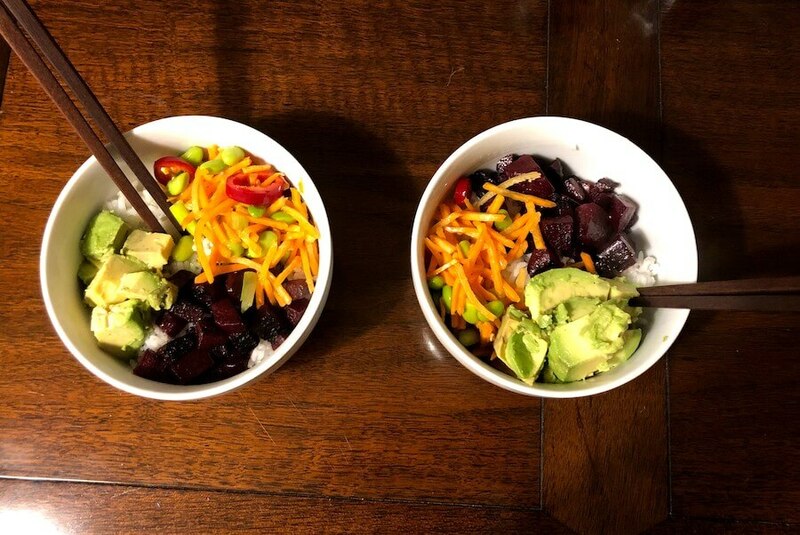 First up, I made the Avocado & Beet Poke Bowl. I figured that after a few days of sitting around in my fridge, this mostly produce-based meal might leave a little something to desire. But everything was so cleverly packaged that the whole meal shone. The carrots were crisp, the avocado was perfectly ripe and the edamame and beets were delicious. Home Chef nailed it with the sauce, which was easy to customize for my picky husband. After a stint of quick-but-exhausting travel, this meal felt as nourishing as it was flavorful. The recipes are easy to follow and have pictures to guide you. Image courtesy of Kacie Goff. I love eating shrimp, but I hate cooking them. The cook time is just so short that I feel like I’m always tiptoeing the line between raw and overdone. But, with the help of my Home Chef recipe, I nailed it in their Baja Shrimp Bowl. This is a perfect time to talk about these recipes because, while I prepared the shrimp, my husband did the rest of the meal. And he really hates to cook, so I tip my cap to both him and Home Chef. 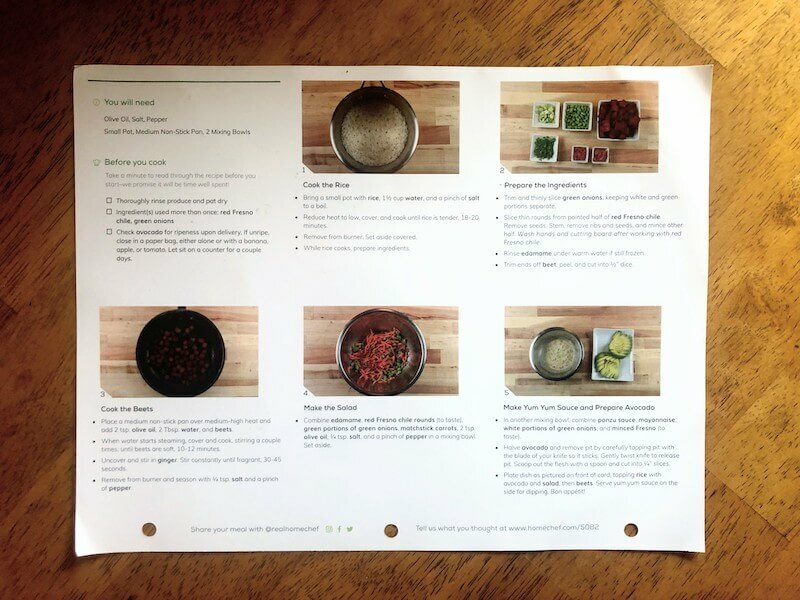 Their recipes have pictures to guide you at every turn (very helpful for amateur cooks) and the steps are broken down so you never feel rushed. Plus, Home Chef makes it super easy by doing a lot of the legwork — like tailing the shrimp or making the sauce — for you. Oh, and as for the meal itself? It was so good we forgot to take a picture. Oops! Ever since we gave up meat, mushrooms have become a staple in our house. Their earthy, meaty texture can really take a meal to the next level — when they’re used properly. Or they can just be weird brown-grey masses in your dish. I’m very happy to report that the Umami Miso-Mushroom-Cream Gemelli Pasta definitely landed in the realm of the former. This meal felt decadent without leaving us weighed down. And as a lover of umami, earthy flavors, this one definitely hit home with me. Plus, how cute is that little round pat of butter? 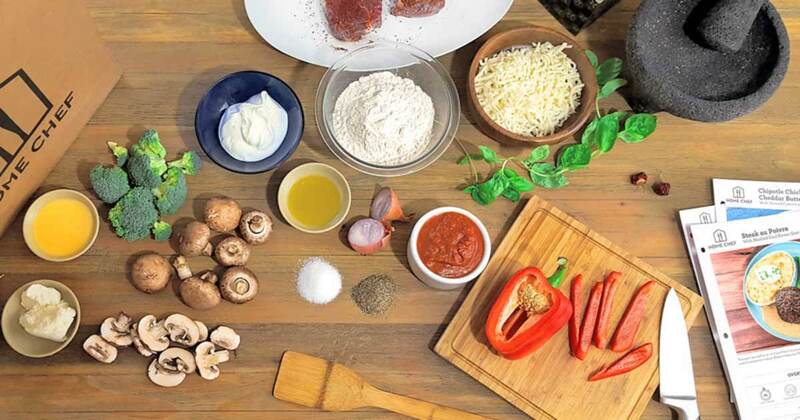 Here’s what you should know about Home Chef before you order your first box. Image courtesy of Home Chef. All in all, I was really thrilled with every meal I got from Home Chef. Here are my key takeaways. Would I order another week of Home Chef meals? Absolutely. While $10 a serving might feel comparable to delivery, you’re getting a fresh, flavorful meal and you control the ingredients. Plus, the time it saves in menu planning and grocery shopping offsets some of the cost in my mind because I dislike both of those activities. Want to try Home Chef for yourself? If you’re interested in checking out Home Chef, we’ve got you covered. Get 3 plates for free with our code “3platesoff” — just head here and get started. You don’t have to be a gourmet chef to live a gourmand life. I’d definitely recommend taking Home Chef for a spin. The post Home Chef Review: Home Cooking Made Simple (No, Really) appeared first on Freshome.com.